With an astonishing range of Pure Silk Saree on display, we loved to explore your pride of having a luxurious Silk Saree from Bengal. Handloom Silk Sarees are timeless. Even being traditional, it’s always in trends and fashion. Pure Silk sarees can be worn for any occasion – traditional, party wear, bridal, wedding silk sarees. And you will find the splendid and rich collection at Online Naksha. Each saree from Online Naksha is aesthetically crafted and stylishly designed. Silk Sarees from Online Naksha consists of Soft Silks, Handpainted Silks, Block Printed Silks, Kantha Stitch Sarees, Designer Pure Silks and more. The Baluchari and Swarnachari Sarees are some of the most unique and exquisite collections displayed here. We deal with best prices to suit your budget. And aims to provide you best and personalised shopping experience from the convenience of your home and delivered to your door step. Silk Sarees also bring in the charisma of a timeless look, for Silk Sarees are never out of fashion. Pair your Pure Silk Sarees with ethnic and traditional ornaments that will add elegance and uniqueness in your look. We value your Time and Money. We are dedicated to Process and Dispatch Orders within 1 working day. We Provide Free Delivery all across India. Cash On Delivery also Available without any extra charge. We Offer World wide Shipping via DHL with Best Shipping Rates. 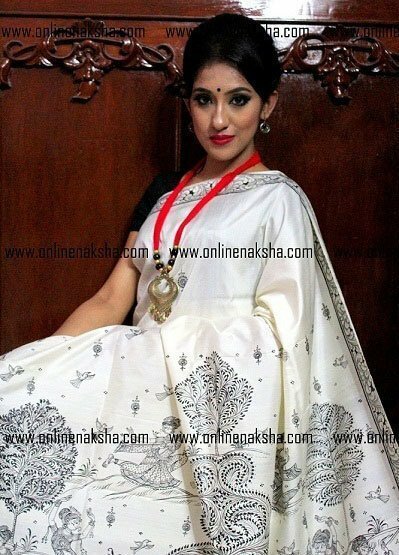 Online Naksha is an exclusive space for unusual and extensive range of ethnic wear. Our designs are extraordinary and perfect choice for anyone looking for exceptional ethnic drape. Our each design is something you will fall in love with. We always make sure that you get the genuine quality of product in very reasonable price. Our vision is to make Handloom Silks affordable for everyone. We are constantly working to make everything more cost effective to creating the lowest possible price for each product. You have arrived to the most authentic space for Natural Pure Silk Products. Online Naksha is certified by The Silk Mark Organization of India, a society set up by the state-controlled Central Silk Board of India. Silk Mark is a quality assurance label for Pure Silks given to those fabrics that are made of natural pure silk. Sarees by Online Naksha are of high quality and are made in the best way to keep up with its essence.